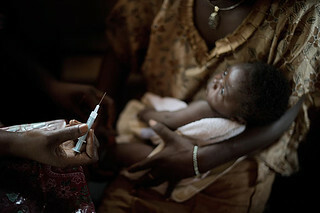 Central African Republic, 2011: A health worker prepares to vaccinate a baby boy in a clinic in Bangui. This and other UNICEF-supported clinics offer routine vaccinations, check-ups, growth monitoring and other basic health services for children and women. Central African children face the eighth highest under-five mortality rate in the world, a result of the impact of poverty and war on children’s ability to survive and thrive.